Every year when Fall comes around I seem to have a new direction I want to take in decorating. Last year I seemed to use the traditional Fall colors...oranges, reds, etc. I've even done the all "neutral" way with lots of burlap, wheat, and white pumpkins. This year when I came across some black and white pumpkins I instantly knew that I wanted to use them in my Fall and Halloween decor. I am totally sure my husband appreciates the change in all new decor every year too! I don't know about you but I decorate for Holidays by leaving as much of my existing decor as I can. I wanted to show all of you how I decorated my three tier stand. I recently just purchased the stand after months of wanting one and I am so happy I did! 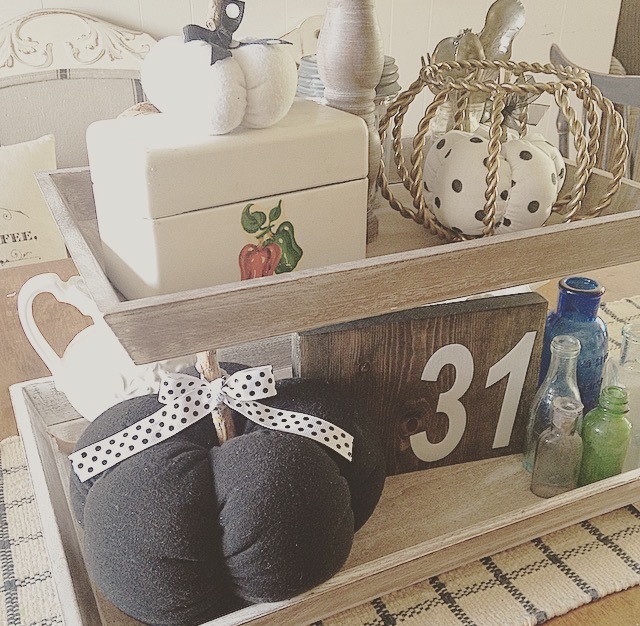 I only took off a few pieces of my existing decor and added the black and white pumpkins which I think adds a bit of whimsy while keeping my vintage vibe. These teacups belonged to my husbands grandmother. I adore them! Instead of just taking them off the stand I added the cute little black fabric pumpkin and nestled it inside the top cup. 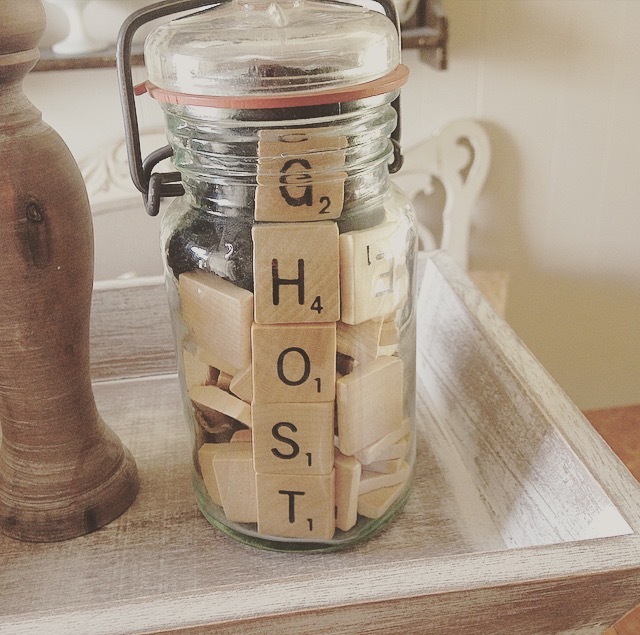 I have a bunch of scrabble tiles that I keep around for cute ideas like this. Actually, I have a whole jar of random game pieces that I stash but we won't get into my hoarding problem right now. I spelled out the word "GHOST" with the scrabble tiles and put them in an old canning jar. I wanted this to also be fun for my girls who sit at this table every night and morning! I found this candle holder in a box labeled "garage sale" that I had in my basement. Apparently I planned on selling it at some point. Once again I have a hard time in letting things go! But see?? It paid off to keep it because I added this cute little polka dot pumpkin inside instead of a candle and I LOVE it! I keep my grandmas recipe box on my stand with all her handwritten recipes inside. I didn't want to move it so I just put another mini fabric pumpkin on top of it. I love my little wood number "31" sign from ART BY KELLY. I tucked it into my bottom tier along with my vintage glass bottles and my big fabric pumpkin. I like to keep my Fall and Halloween decor simple. Now Christmas is a whole different story! Thanks for reading how I decorate for Fall while keeping a hint of vintage in my existing decor. I would love to hear what colors YOU decorate for Fall with! Thanks again friends and have a Happy Fall! Congratulations on your beautiful new blog! I'm looking forward to seeing all of your posts! Wooooo Hooooo!!!!! Those teacups are so cute!!! Happy Fall! 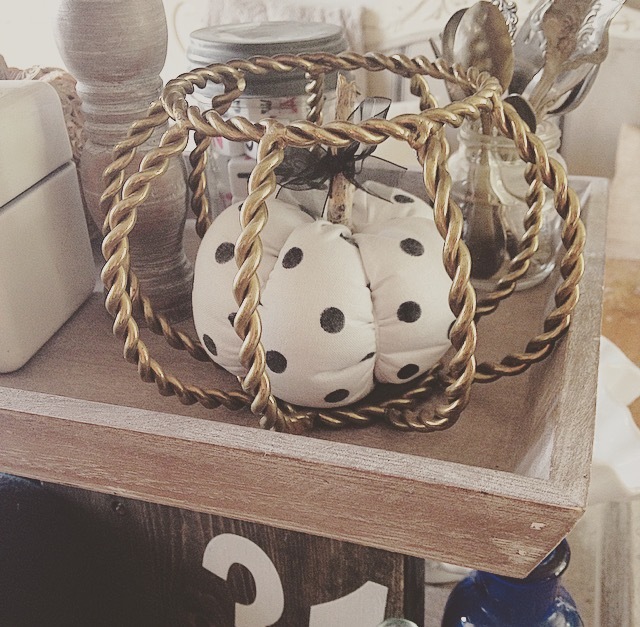 Love love your ideas, adore the poka dot pumpkin. I think about how lame my very first post was and have to say that you "knocked it out of the park". 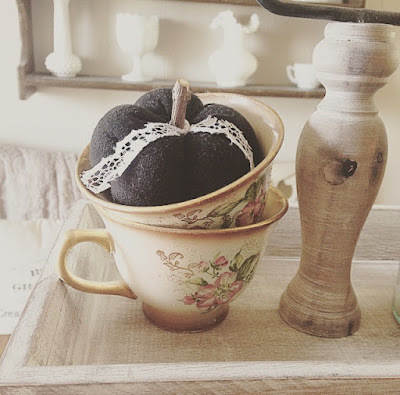 fun pumpkins ... sweet family mementos ... great post! BTW - I wanted to let you know that I am here after seeing your post on Instagram. Congratulations on your new blog! 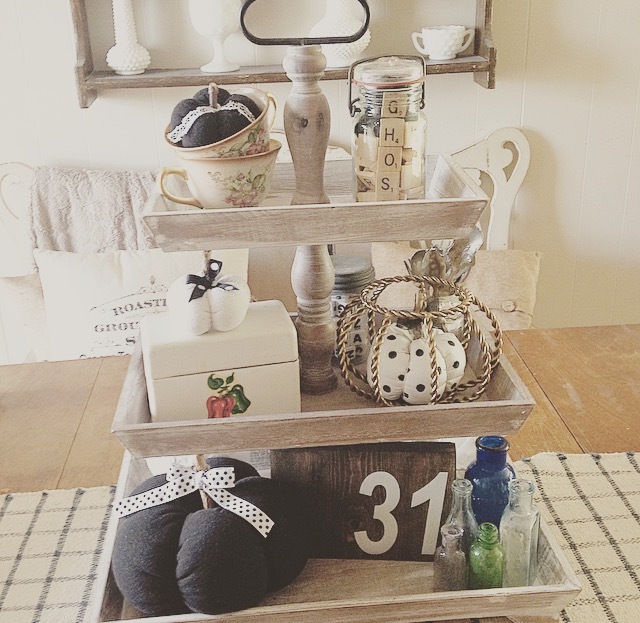 Love the tray too! Love it all friend! Congrats again on your blog! This is so sweet and creative. I like all of the neutral colors! This is so precious! I love it!!! !